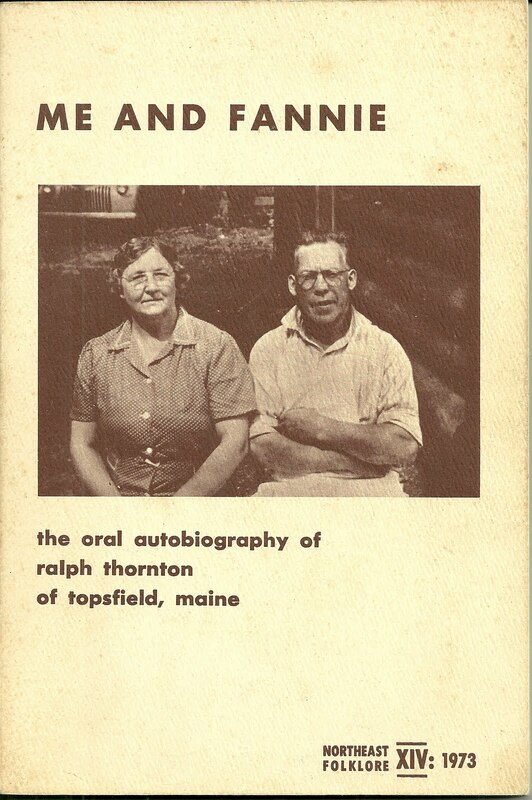 Heirlooms Reunited: "Me and Fannie, the Oral Autobiography of Ralph Thornton of Topsfield, Maine"
"Me and Fannie, the Oral Autobiography of Ralph Thornton of Topsfield, Maine"
I've come across a wonderful book entitled "Me and Fannie, the Oral Autobiography of Ralph Thornton of Topsfield, Maine". It's part of the Northeast Folklore Series, XIV: 1973. Edited by Wayne Reuel Bean [who knew Ralph personally and got the idea for this book while a student at the University of Maine]. The series was edited by his professor Edward D. Ives, with the copyright held by the Northeast Folklore Society, 1974. Ralph Agustus Thornton, one of seventeen children, was born 10 September 1885 on the Snigdom Road in Topsfield, Maine, to George Harvey Thornton and Wilhelmina "Willie" (Bailey) Thornton. His paternal grandparents were William and Temperance (Harvey) Thornton of Topsfield. Temperance was born, I believe, in the town of Industry in Franklin County. Ralph's maternal grandparents were Thomas and Philinda Ann (Lakin) Bailey, born in Robbinston, Maine, and Charlotte, Maine. Some sources have Philinda born in Perry, Maine, which abuts Robbinston, but Philinda's family did have a connection to Charlotte, Maine, so I guess I'd favor, without direct evidence otherwise, Charlotte. On 19 September 1910 at Topsfield, Maine, Ralph Agustus Thornton married Fannie M. Hamilton, who was born about 1892 in Maine, the daughter of William John Hamilton, Jr. and Mary E. (possibly Ellen) (Boyen) Hamilton. Her paternal grandparents were William John and Lydia (?) Hamilton. I've had no luck in finding the parents of Mary E. Boyen, though on records of her children's birth and marriages, she gave her place of birth as St. George, New Brunswick. 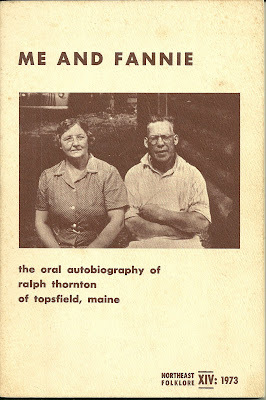 Ralph and Fannie raised their daughter and son at Topsfield, Maine. Ralph took on jobs from all over in order to raise his family, from various camps in the deep woods of Maine to hospitals in Massachusetts and Augusta, Maine. On his timeline, he noted that he was the first person to Topsfield to produce an oral autobiography. And it's a great read! If you have any corrections, additions or insights regarding any of the information presented here or in the family trees of Ralph Agustus Thornton and his wife Fanny M. (Hamilton) Thornton.